Last week, I mentioned that, in deepening our understanding of the liturgy and how it is celebrated, we would dispel some of the “myths” surrounding the liturgy. Some of these assumed ideas have once come around since the Second Vatican Council, and we get stuck into one right now. Incense wasn’t officially banned from liturgy any more than Latin was (but that’s for another week). In the first half of last century and before, incense was common in our liturgical celebrations; so much so that people who talked about Catholic liturgy often referred to the “bells and smells”. Today, in some places, the only time incense is used is during a funeral. Incense is still used in liturgy to give due reverence and acknowledge the sacredness of an object (for example, the bread and wine or the altar) or of people (the assembly at Mass, the deceased at a funeral). What did change was how incense was used. The Council’s call for liturgy to be marked by a “noble simplicity” and to be free of “unnecessary repetition” meant that many of the rules of how many times the thurible (or censer) was swung, and in which directions, were done away with. Generally three swings of the thurible towards a person or object is the common practice today. Incense is specifically called for on particular occasions, such as at a funeral, on Holy Thursday and the Easter Vigil, and when an altar is dedicated. It can also be used at any other time unless it is specifically excluded (such as on Good Friday). It should, at the very least, be used to provide a greater degree of solemnity on special occasions or at a principal Mass each Sunday (the 9:30 a.m. Sunday Mass at St. Patrick’s Cathedral is a good example). There’s even a fairly new range of incense made to meet the needs of asthmatics and people with allergies (which I must track down and order). 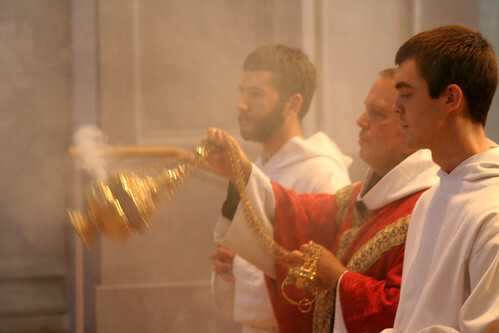 Despite its former strict usage rules disappearing, incense remains an important way for our liturgies to make use of signs that are “perceptible to the senses”, as was called for in the Second Vatican Council. Previous Previous post: 16/9/07 – Which Rite is Right?